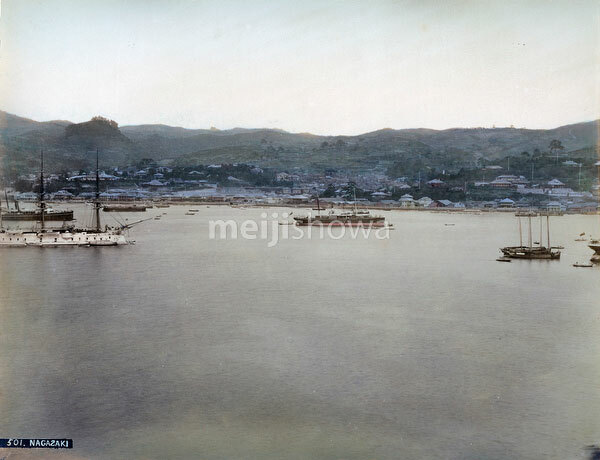 Nagasaki Harbor and the foreign settlement as seen from the west bank, taken between 1882 (Meiji 15) and 1892 (Meiji 25). Several large ships are anchored in Nagasaki Harbor. Because of its strategic location between China and the US, as well as the availability of high quality coal from nearby Takashima Coal Mine (高島炭鉱等), Nagasaki was a very popular coaling port during the Meiji Period. This image makes a panorama with image #80717-0001 – Nagasaki Harbor.